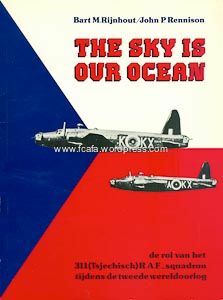 ‘The Sky is Our Ocean’ is a history of an English squadron in the years 1940/1945. 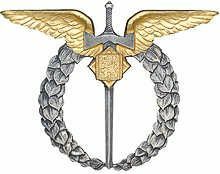 This squadron was composed almost uniquely of people of Czech origin, who escaped from their home country in 1939 before the invading German troops. They came without any prospects via Poland to France from whence – after the French capitulation – they made their way to England. There they got flying lessons again. Because of the linguistic problems, the air force authorities decided to give them their own unit. 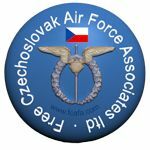 At the end of July 1940, 311 (Czechoslovak) Sqn. came to being within the Royal Air Force. The Czech threw themselves in the war with great courage and motivation, often as retribution for what Hitler’s Germany had done to them. As one of the first, this squadron executed a bombardment (air raid) of Berlin. They flew under the orders of ‘Bomber Command’ until mid-1942. Dozens of aircraft and their crews didn’t return home. As the anxiety of being shot down in the occupied territory increased continuously – captured Czech pilots were exposed to heavy interrogation during which the names of their Czechoslovak family members back at home could be disclosed unintentionally – the air force authorities decided not to let the squadron fly to the areas occupied by the enemy any longer, but put them in the service of the ‘Coastal command’ instead. There the Czechs quickly excelled in comparison with their colleagues from other squadrons. Several blockade breakers were screwed (ground) into ground by them, whilst also a number of submarines got the worst of it. Thus the squadron flew in the RAF until the end of 1945. The Czechs, who after their ‘jump’ or emergency landing ended up in a POW camp, have made great use of themselves during various escapes. One of the most famous ones is certainly the ‘Great Escape’ from the camp Stalag Luft III, where 76 RAF pilots managed to escape after digging out a tunnel, amongst them three Czechs. Unfortunately, the majority of the escapees were recaptured and on Hitler’s orders fifty of them were murdered, one of them a Czech: Arnost Valenta. ‘The Sky is Our Ocean’ describes the hard reality of war and can be viewed as an important war documentary.